Fishing is a popular pastime. As they say, "Fishing is not a matter of life or death - it's MORE important than that !" Why go fishing? Fishing is a wonderful sport. It is an inexpensive way to enjoy the great outdoors, it can be relaxing or stimulating and exciting. You can catch dinner or just experience the thrill of the catch and let them go (this is called catch and release) You can fish alone, or with family and friends. Anywhere there is water - anytime! This section is a starting point for anyone interested in taking up the hobby and sport of fishing. We cannot stress too much - Consult your local tackle store. They are professionals and also fishermen who are very willing to help you get started the right way. Don't be afraid to ask questions! or contact a local Fishing Club. WHERE DO I FIND FISH? When getting started in the sport of fishing, you don't need fancy and expensive gear. A hook and a length of fishing line will catch fish! You might like to start with a handline (about 100m of fishing line wrapped onto a plastic ring called a caster) This will help give you the "feel" for catching fish. You will get to know the feel of a fish taking the bait and how a fish runs and fights. You wont be able to throw (cast) the line as far as a rod and reel, and a handline is best used off a wharf, jetty or boat. A good size line for your handline is about 4 to 8 kg breaking strain. Lighter line works best, thicker line can be seen by the fish and it gets dragged around by the wind and current. Also with lighter line, you can "Feel" the fish messages. Add a hook, sinker and bait (more about that below) and you're ready to go fishing! When you think it's time to progress further than a handline, it's time to visit your local tackle shop to select your first rod and reel. Select a good medium priced outfit. There are some very cheap rods and reels on the market, but these may break easily and in the long run you will be better off buying a better quality outfit. When visiting your local tackle shop, discuss with the staff the type of fishing you would like to do, and tell them you're a beginner. This way you will get an outfit that is suitable to your needs. Each one of the above reels is suited to a particular type of fishing. When you're starting our the two most suitable types are the threadline (also called a spinning reel or eggbeater) and the sidecast reel (an Alvey is very popular) To select the type that best suits you, if you are going to mainly fish freshwater, lake, harbour or estuary then a threadline is your best choice. If you are going to be fishing from a boat, the beach or rocks, then choose the sidecast reel. A medium sized, lightweight threadline that holds 150 - 250 metres of 3-6kg line will cover most fishing conditions. A lightweight sidecast reel with a fairly large spool, say around 14 cm diameter, will hold plenty of line, be easy to cast, quick to wind in and not be prone to twist and tangles. Always look after your reels. When you have finished fishing for the day, wash it down with some mild soapy water and oil the moving parts about once a month. This way, your reel will be in good condition for the next time you want to go fishing. Now that you've chosen your reel, you need a rod to match. There are many types of rods to choose from, made from many types of materials. The rod needs to match your reel, and this is where good advise from your local tackle store comes in handy. Take your time when choosing a rod. Try using some of your friends, or most tackle shops have some that you can wave around a bit! A rod should be light enough for you to fish all day, and not tire you, but be strong enough to help you pull in that big fish. If you have chosen a threadline reel, choose a rod that is about 1.7 to 2.2 metres long, with a light tip and a stiffer lower end. If you will be fishing from the beach, rocks or a wharf using a larger threadline, choose a slightly longer and heavier rod. Rods can be one or two piece. The two piece rod transports and stores easily. Care for your rod the same as your reel - wash it down with mild soapy water after each fishing trip. Obviously the most important type of terminal tackle is the hook. There are numerous types of hooks in all shapes and sizes, but to start out you will only need a few types. Hook sizes can be confusing, as the larger the number - the smaller the hook when sizing is below a No. 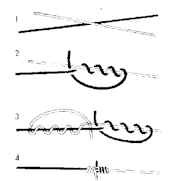 1 (a good all-round hook size for general fishing) After No. 1 the numbering system changes and the larger the hook, the bigger the number. By the way - 1/0 is pronounced as "one-oh" in Australia or sometimes "one-naught". To have a good range of hook sizes to suit your needs when beginning, buy some No. 12, 6, 4, 1, 2/0, 4/0 and 6/0. Your tackle shop will be able to advise you on what type of patterns will suit you. Get a few "long shank" hooks as well. These are easy to remove from fish and can stop some toothy fish biting through your line. Always make sure your hooks are SHARP. Use a hook hone or a fine file to touch up the point each time you go fishing. Sinkers are lead weights that come in many weights, sizes and shapes. They help you to cast and get the bait down to the fish. There are only a few types that you need to get started. Two very useful ones are the Ball Sinker and the Bean Sinker. These have a hole through the middle, through which you thread your line and they can move freely up and down the fishing line. Buy a few of each in different sizes. Remember, use the lightest and smallest sinker that does the job of helping you to cast and getting the bait to the fish. Swivels are made of brass or stainless steel with a body and an eyelet at each end. They do just what the name says - swivel. 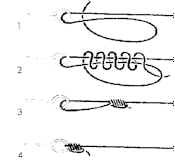 They join pieces of line together in a rig and take the twist out of your line (which can cause tangles) They are numbered the same way hooks are, and as a general rule, the smaller the better (to suit the line) For fishing with a threadline, choose No. 12 and No. 10 sizes. For beach or rock fishing with a heavier line, choose about a No. 8. These do what the name says - Float! They are used to keep your bait from sinking to the bottom. You can set the depth from just under the surface to just above the bottom. There are several different types of floats to choose from. Popular types are the quill, bobby cork, bubble and pencil. For general fishing one or two pencil floats and light bobby corks are all you need. Bait is the thing you put on your hook to entice fish to eat! Below are a few types of bait you can use. There is a wide choice of baits you can use for freshwater, they can be used live, fresh, frozen, dried or salted. Earthworms - straight from your garden! Scrubworms - bigger than earthworms and you will find them under dead leaves, compost and logs in dark shady places around water. Digging in these places also produce worms. Yabbies - freshwater crayfish. They are best used live, just place the hook through their tail. Bait Fish - Small fish are good live, or use frozen Whitebait that you can purchase from your local tackle shop. Insects - Some good insects are grasshoppers and cicadas. With saltwater baits there is a very large range. Following are just a few. They can be used live, fresh, frozen or salted. Prawns - One of the most popular saltwater baits. To use live, lightly hook through the shell, but don't kill them. You can use them dead whole, headed and peeled, or cut into small pieces. Worms - The best worms for bait are bloodworms, sandworms and beachworms. Use them live if possible, but good store purchased frozen ones also work well. Nippers - Also known as marine yabbies. These burrow in the sand in most estuaries and saltwater lakes. They are pink and white and have one claw bigger than the other. Use them Live. Watch out for that bigger claw, then can give you quite a pinch! Squid & Octopus - These can be bought fresh or frozen. Small squid can be used whole for larger fish, but are generally best used cut into strips. Shellfish - Mussels, pippies and oysters are among a few crustaceans that you can use for bait. Bread & Dough - Works well, and is inexpensive. 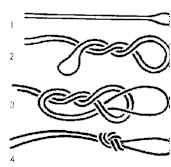 You just need a few basic knots to get you started, and once you've mastered these, you won't have to learn many more to see you through your fishing life.